Humana and ADPP-Guinea-Bissau are implementing since 2009 the Farmers' Club project, in Oio, which is involving 2,000 farmers. The aim? Taking advantage of the huge agricultural potential to break out of poverty. In this case, by adding energy provision to the array of other activities the program provides and builds among the farmers. The training of all the farmers was indispensable for the technical installations to work and to create awareness about sustainable energy. Besides that, they have been learning from each other, sharing experiences and resources and working together on the buying and selling of their products to obtain the best prices. According to the project technical staff involved, the training of the farmers plays a crucial role in reducing poverty in Guinea-Bissau, one of the poorest countries in the world, where 60% of population lives under USD $2 per day, ranking 176th out of 187 countries in the UNDP Human Development Index for 2012. Even though the Agricultural sector employs 85% of the labor force in the country, the rural areas are still the forgotten ones: 94,3% of the population does not have access to electricity. 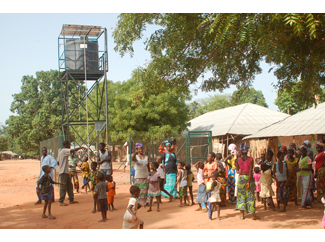 The Farmers’ Club Rural Energy project, which will run until the end of October 2015, focuses on the establishment of 24 solar powered water systems (pumps and tank) for irrigation and 51 solar lighting systems for social institutions (schools, mosques, clinics...). The solar panels that have been installed vary depending on the intended use of every building: for example, schools have just a panel with five bulbs, which is enough to light the room. However, the community center requires three panels as it is intended to be used for leisure activities such as watching football games around a television. 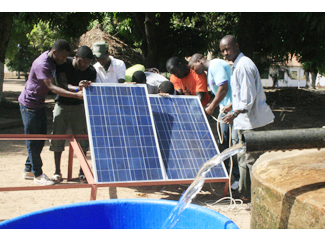 The water supply facilities demand a greater investment in photovoltaic systems with five panels installed. The project also includes a bio-fuel electrified production center that will serve, as well as for the generation of energy, as a new initiative to promote start-up business among the rural farmers. This center is designed to enable farmers to process the agricultural products they produce, to establish sales activities of these processed products and so to generate incomes. The establishment of small businesses to sell processed agricultural and horticultural products enables farmers to increase their incomes, to create jobs and to develop its agricultural way of production. The common work has created important links and connections between members of the clubs and the local, regional and national institutions. 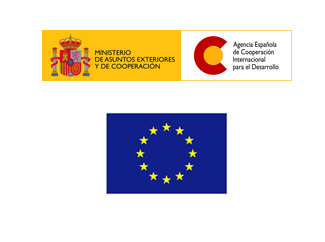 This project is being supported by the EU and AECID.